If you want to show the world that your cat can conjure lightning, Microsoft's Photos app can help. Remember that cool video demo last year where Microsoft’s Story Remix turned a soccer ball into an exploding meteor? Well, Windows 10 Insiders can now edit in 3D objects within videos, too, part of an updated Photos app within the Fall Creators Update. If you’re part of the Windows Insider program, make sure you’re up-to-date with the latest Insider build to find the new 3D effects capability within the Photos app. Also note there’s a companion app called Photos Add-on, which appears to be the repository for most of the new 3D content. 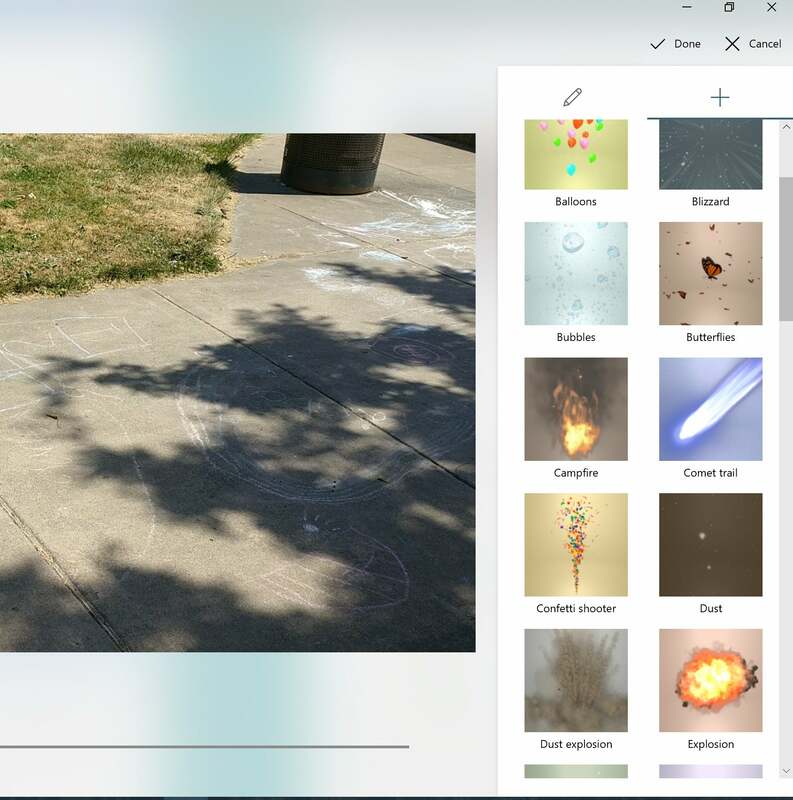 Microsoft’s Photos app has evolved into a slideshow creator and editor. What this means to you: If you haven’t been following the ins and outs of Story Remix, don’t worry. It appears you’ll receive the feature as part of the Fall Creators Update, which is due to arrive on October 17. Where it gets a bit confusing is that Story Remix isn’t actually an app any more. Its capabilities have been folded into Microsoft’s very good Photos app, which handles photos and video. 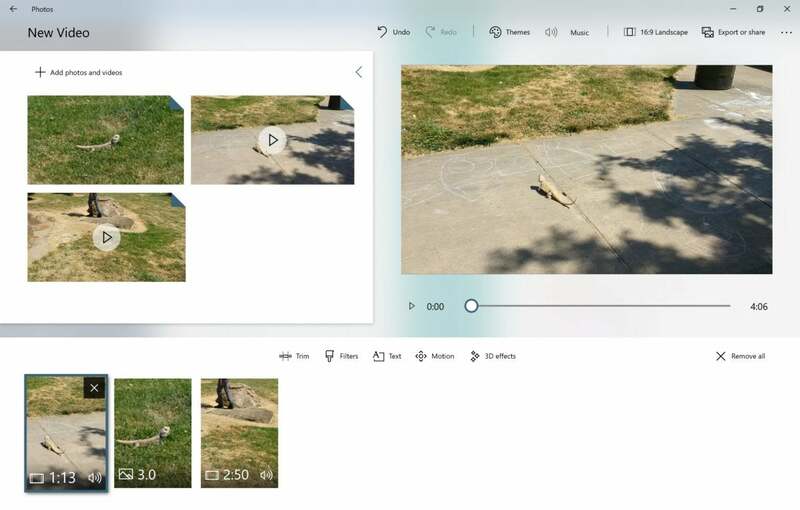 The latest wrinkle involves the ability to edit in 3D objects inside videos that you can edit within Photos, a flashy, fun feature that’s mostly exclusive to the Windows platform. 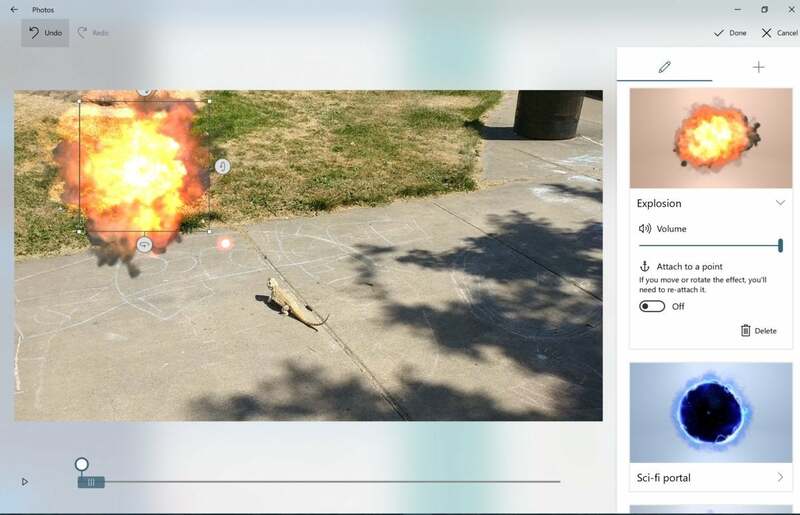 Microsoft originally announced Story Remix in June, wowing its Build audience with virtual dragons that breathed fire, meteors, explosions, and the like. Build attendees then discovered that Story Remix was actually a feature of the Photos app—and that the 3D capabilities had been left out. At the time, Microsoft was busy transitioning Photos from just a gallery app and editor into something that could stitch photos and videos together to make slideshows, a feature that Google’s own Google Photos app had done algorithmically. But Google didn’t and still doesn’t add 3D effects to those slideshows, giving Microsoft’s own 3D effects added weight. Some of the new 3D effects within Photos. The Photos app for Insiders already allowed you to add filters, music, and transitions to your slideshows, as our earlier hands-on showed. With the recent update, the new 3D effects feature allows you to take a single video (or more than one, if you plan to stitch them together) and add 42 different 3D effects. Because each of the 3D effects adds motion in some way (a lightning strike, falling leaves, a portal opening) you can’t add them to static images. Each effect is adjustable, including its size and orientation, as well as the time it remains on the screen. Even the effect’s audio volume can be dialed up and down. Each of your new video creations is saved under a separate Creations tab, rather than overwriting the original video file. That’s a plus: You can pep up your videos of your kids and pets for sharing with your friends, while saving the originals for your own pleasure. Windows Insiders can try out the 3D features now, or just wait until the Windows 10 Fall Creators Update releases in a few weeks. If you need a helping hand trying out the new features, stay tuned—we’ll have one shortly!